When I go to celebrity golf tournaments, I always make sure there's a Pro AV contingent to the program. Happily, the BMW Charity Pro-Am presented by SYNNEX Corporation provides this opportunity annually in Greenville, SC, and I have twice enjoyed the privilege of attending the event, taking in the celebrity scene and learning more about SYNNEX's Pro AV business. 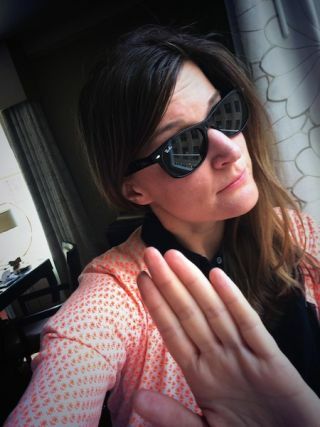 Practicing my SYNNEX BMW Celebrity ProAm "no photos, please" pose with my new Ray-Ban sunglasses. I was thrilled when during the action-filled days of May 14-17 I was able to hobnob with famous figures like Mike Boettcher from Advanced AV, Dave Berlin from VCA, Paul White from CompView, Jeff Stoebner from AVI Systems, Dana Barron from HB Communications, Jeff Irvin from Spinitar, and PSNI executive director Chris Miller. We enjoyed several days of optimum hang time, with the occasional conversation with other celebrities like Frankie Muñiz from Malcolm in the Middle, Rob Riggle from The Hangover, John O'Hurley (aka J. Peterman) from Seinfeld, Richard Karn from Tool Time on Home Improvement, and a guy named Jim McMahon who traveled with a massive bodyguard I would have called the Refrigerator if the name weren't already taken. While we enjoyed sumptuous appetizers and drinks, pausing now and then to drive BMW sports cars at the auto manufacturer's Greenville-based Performance Center, engage in clay shooting, or take a few shots at relaxation at a spa, we were constantly looking forward to spotting real SYNNEX A-listers that we usually only see on the red carpet, people like TJ Trojan, SVP, product management, or the glamorous Sandi Stambaugh, director of visual solutions product management and Tommy Plumer, director of ProAV, videoconferencing, and physical security sales. Spending time with these luminaries and the fabulous, charming product managers who make dealing with SYNNEX a real pleasure, was enhanced by conversations with Pro AV Summit sponsors NEC, Chief, Peerless, Samsung, Panasonic, Sharp, Sennheiser, Epson, Viewsonic, LG and C2G. Celeb sighting!! TJ Trojan from SYNNEX (aka Kurt Russell). The factor that all who attended this illustrious event shared in common was success. From the top of the chain at the SYNNEX Pro AV Summit came two mantras: treat our customers like friends, and help our resellers and vendors become even more successful, which in itself is a pretty friendly idea. Evidently this angle is working, because the AV integrators who partner with the $10.8B annual revenue SYNNEX are seeing good numbers themselves. Expect all of those figures to increase. So far in 2014, SYNNEX has reported Q1 revenue of $3.03B, a 23% uptick year over year. Helping to carry on the company's 107 consecutive quarters of profitability is Peter Larocque, president of North AmericaDistribution and mastermind behind SYNNEX's Share the Magic charity event, which in a single evening raised just over $1M for local children's charities. Addressing the Pro AV Summit crowd just before the vendor showcase, Larocque drew some powerful associations between IT and AV business models. Referring to a conversation with a video vendor about the shift from hardware to software-based products, Larocque illustrated other ways in which consumer and IT trends will influence the AV side of the business. "Mobility is going to be a big thing," he declared, elaborating by point to the newer generations that access the world via apps. "My kids will never wait in line for anything, you can get anything, and you don't have to be rich to get it, you only need the app." Larocque also noted that in addition to mobility, SYNNEX is invested heavily in all the major boons to business at present, including cloud, big data, government, and education. Spotted at SYNNEX Pro AV Summit: Malcolm in the Middle! As the AV model changes to one more similar to that of SYNNEX's main distribution contingent, the IT channel, the company's five-year-old Pro AV division is continually evolving to provide better support to integrators. Going beyond pricing and availability, the Pro AV group provides field services, staff augmentation, third party maintenance, recycling and disposal, asset buy-back, NOC services, help desk, hosted email compliance, storage and server assessments, and many other support options. And Plumer is always adding his own sales tools and margin maximization efforts to the reseller mix. He and fellow SYNNEX eleven-year-dedicated powerhouse Sandi Stambaugh are good allies to have in the quest to expand and evolve AV businesses for the mobility-driven future. SYNNEX's VISUALSolv group addresses Pro AV, digital signage, and surveillance aspects of the integration market, and as verticals and technologies continue to evolve and converge, SYNNEX is offering new opportunities in connection with POS sales via its STORESolvbusiness. And the customers are ready to add new angles, Trojan said. Indicating the Pro AV Summit attendees, he observed, "These are good business people, they change with the times. Their perception of distribution has changed a lot over the past few years-partly because they really need to tie in with the IT. Three or four years ago, we talked to these folks about how we could help them prepare for the convergence of AV, IT, CE, and IP. Interestingly, not only has that occurred, but the convergence evolution, which is very disruptive, has been led by the consumer with the consumerizatin of IT. It is where SYNNEX is going, and it's where AV is going, because it's really all about digital, the cloud, big data, social analytics, and mobility."